Will Automatic Doors Benefit Your Business? Depending on the type of business you have, whether it be a hotel, shop or head office, if your business involves a steady stream of customers and clients coming in and out of your building, automatic doors may well be a worthwhile upgrade for your premises. Automatic doors provide great security, as they can be set to lock at certain times and can only be manually opened by someone inside the building. They also provide ease of access for those in wheelchairs, the elderly, or those with a physical disability, and are very convenient for anyone trying to enter your building will their hands full. One of the biggest benefits these kinds of doors offer to businesses however is the fact that open doors act like an invitation to come in. If you’ve ever walked up to a business with a closed door and wondered whether or not it’s actually open, you’ll know what we mean. Doors that open as you approach take this apprehension away and should significantly improve the footfall into your premises. Different businesses will benefit from different kinds of doors. Super-busy buildings may benefit most from a revolving automatic door. These will control and slow the flow of people in and out of the building. Automatic swinging doors are convenient, quiet and allow easy access; they are ideal for hospitals. 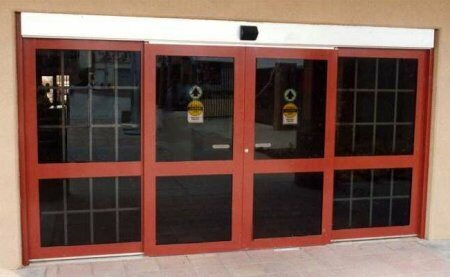 Automatic sliding doors are beneficial to any business with limited space but they still allow easy access to the building. – They’re built to last. With proper maintenance the doors will last for years. They are sturdy, durable and of course, provide great security for the building and its staff. – Help prevent queues. Especially during peak time, a manual door can cause a build-up of people queuing. Automatic doors allow traffic to flow in and out constantly, helping you to run your business or company more efficiently. – They’ll help you comply with the law: a business is legally obligated to ensure that visitors of all ages, disabled or able-bodied, have safe, easy and comfortable access to your building. – They can cut your bills. As automatic doors close themselves you will not be losing heat (or cold air) unnecessarily.